If you've been following my Instagram, you know it's a delicious month in my world. First, a trip to Burlington, Vermont to visit Ben & Jerry's--yes, I will post about it--and now I'm in New Orleans doing New Orleanian things. But before I left, I did get to celebrate a little bit of St. Patrick's Day! 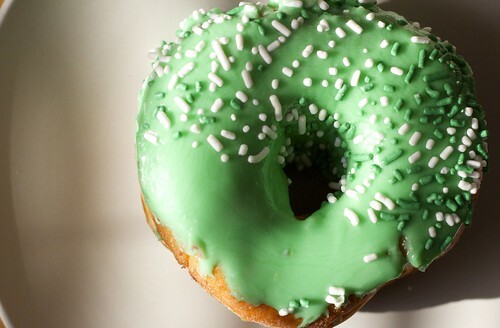 Well, I should be celebrating it plenty today, but it probably won't involve green frosted doughnuts. A friend & I stopped by Peter Pan late Saturday afternoon and I just couldn't not get one, even though I had had more than my fill of ice cream and knew that beignets were in my future. It's just SO PRETTY! Knowing Peter Pan, these beauties will be around all day, so go celebrate!